Stems: Erect, lower portion soft-hairy. Leaves: Basal leaves persistent, circular or mostly egg-shaped in outline, .4 to 1.2 inch long and wide, sparsely soft-hairy; some blades deeply 3-5-lobed; margins scalloped; bases cut straight across to broadly rounded; tips rounded-blunt; stem leaves deeply divided, sessile to nearly sessile, often 3-5-cleft; segments varying; upper stem leaves reduced to bracts above. Inflorescences: Flowers borne singly on terminal and axillary stalks; 8-35-flowered. Flowers: Stalks glabrous or soft-hairy; sepals 5, 1/12 to 1/6 inch long, greenish-yellow, back side glabrous or pubescent; petals 5, inconspicuous, shorter than sepals, yellow, fading white. Fruits: Achenes, 10-40, tiny, glabrous, dull, in spherical to cylindrical heads. Habitat: Open or rocky woods, shaded bluff ledges, meadows, clearings; moist or dry rocky or alluvial soils. 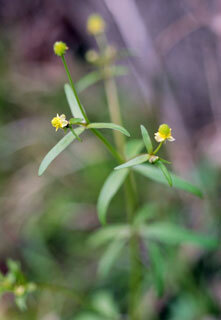 Comments: Similar to early wood buttercup, Ranunculus abortivus, but leaves, sepals, and fruiting heads smaller.